I was out of town over the holidays when the massive snowstorm hit the northeast. At work they declared the first snow day in seven years and I missed it! Because I was in Canada! The irony was deeply irritating. I almost wanted to go back home just so I could take advantage of the snow day, but unsurprisingly, it was snowing in Canada too, so I stayed indoors instead. A couple weeks ago, though, we got hit by blizzard #2, and I had the chance to hole up indoors, hiding from the harsh weather and feeling excessively cozy. 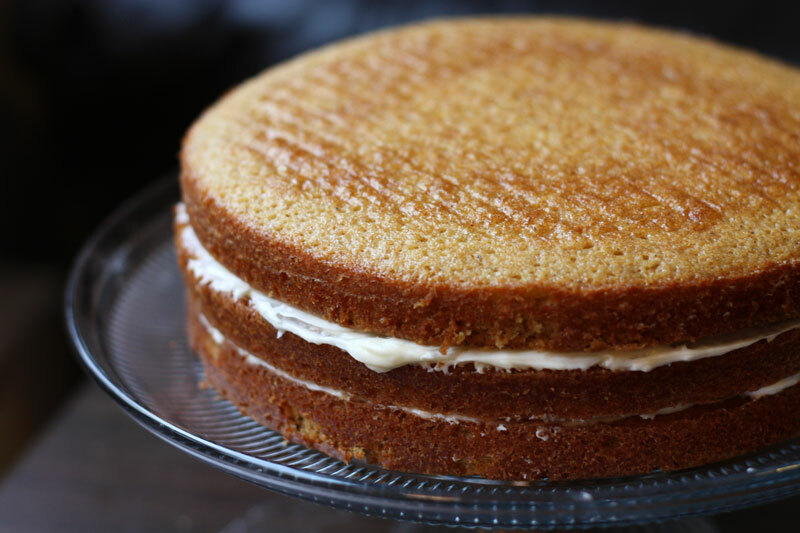 I also was seized by the urge to make a snow-appropriate cake, but only on the condition that I didn’t have to go outside to buy any missing ingredients, which I was pretty sure would lead to a melodramatic death by snowstorm. Luckily, I always have butter and cream cheese in the fridge (healthy person that I am), so it wasn’t too hard to come up with a feasible recipe. I had to substitute the sour cream and reduce the orange peel, but really, who likes citrus that much anyhow? No one, that’s who. This cake is perfect comfort food, and should ideally be eaten while drinking hot chocolate and feeling very smug about being indoors while it snows outside. Although the layers look fancy, it’s really not much work. Apparently it’s supposed to snow again tomorrow – although I personally don’t believe it because clearly all the snow is already in towering mountains on my driveway – and if so, I might just make it again. I found that there was just barely enough frosting to coat the cake. I liked the ratio, but if you’re a frosting fanatic you might want to up the frosting recipe by a half. Preheat oven to 350°F. Lightly grease three 9-inch-diameter cake pans and line bottom of pans with parchment paper. Butter and flour pans; tap out excess flour. Sift first 8 ingredients into medium bowl. Using electric mixer, beat sugar, butter and orange peel in large bowl until fluffy. Beat in eggs 1 at a time. Stir flour mixture into butter mixture alternately with sour cream and milk. Divide batter among prepared pans. Bake cakes until tester inserted into center comes out clean, about 25 minutes. Transfer pans to racks and cool 10 minutes. Turn cakes out onto racks and cool completely. For frosting, beat cream cheese and butter together until smooth. Beat in sugar, then vanilla. Chill until ready to use. Place 1 cake layer on platter. Spread 2/3 cup frosting over. Top with second cake layer. Spread 2/3 cup frosting over. 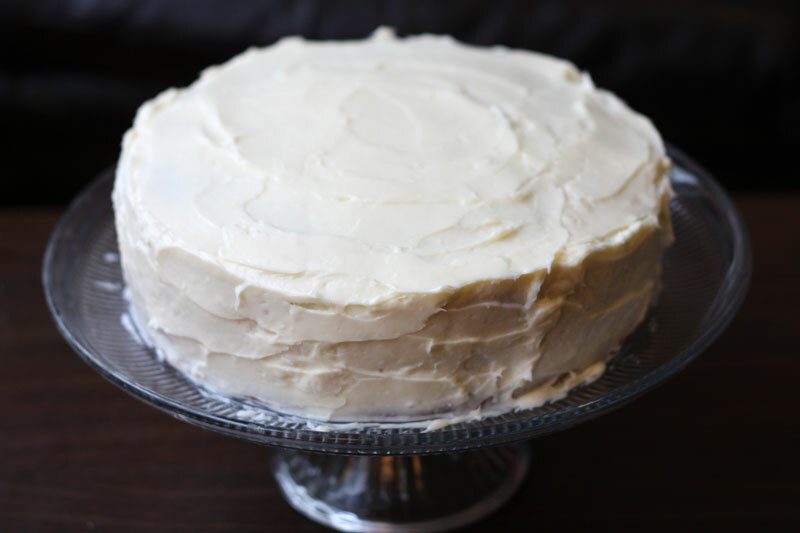 Top with third cake layer. Cover top and sides of cake with remaining frosting. Although I wasn’t particularly good this year, Christmas brought a heaping pile of shiny new kitchen gadgets. I wouldn’t have predicted a couple years ago that I would get excited about small appliances, but now the arrival of a stand mixer at my doorstep is thrilling! I’ve somehow become a kitchen dork. I immediately wanted to make towering cakes and extravagant meringues and all sorts of exhausting things, but then I remembered that I don’t really know how to use a stand mixer yet. So in an rare moment of wisdom, I decided to start small. That turned out to be an extremely good idea. 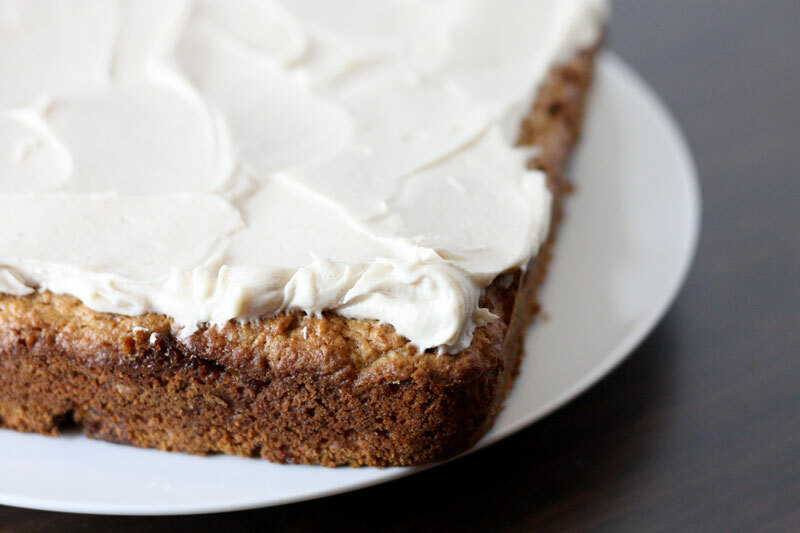 I picked a simple applesauce cake: one layer, cream cheese frosting. I spilled flour everywhere, and accidentally wildly overbeat the batter by my apparent inability to understand basic speed controls, and it was still delicious! I even somehow managed to leave an unmixed swirl of applesauce running through the cake, and this indestructible cake rose perfectly anyhow. 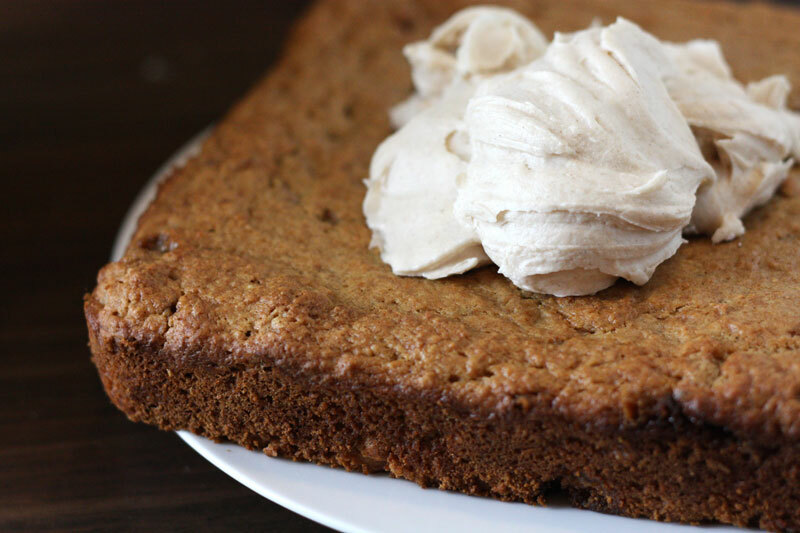 This recipe makes a gently spiced, moist and dense cake. You can cut it into breakfast squares if you’ve already abandoned your New Year’s resolutions, or save it for dessert – either way, it’s very welcome on a chilly January day. And apparently, impossible to mess up, so give it a try! Preheat oven to 350°F. Butter a 9-inch square cake pan. Whisk together flour, baking powder, baking soda, salt, and spices, and set aside. In a large bowl, beat butter and brown sugar with an electric mixer at high speed until pale and fluffy, 2 to 3 minutes. Add eggs 1 at a time, beating well after each addition, then beat in applesauce. At low speed, mix in flour mixture until just combined, then stir in walnuts. Spread batter evenly in pan and bake until golden-brown and a wooden pick inserted into center comes out clean, 40 to 45 minutes. Cool in pan 15 minutes. 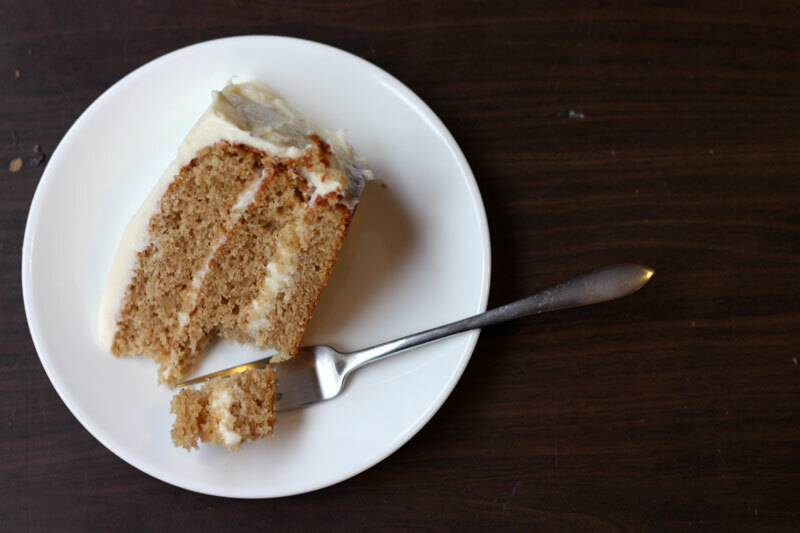 Run a knife around edge of cake to loosen, then invert onto a plate. Reinvert cake onto a rack to cool completely. 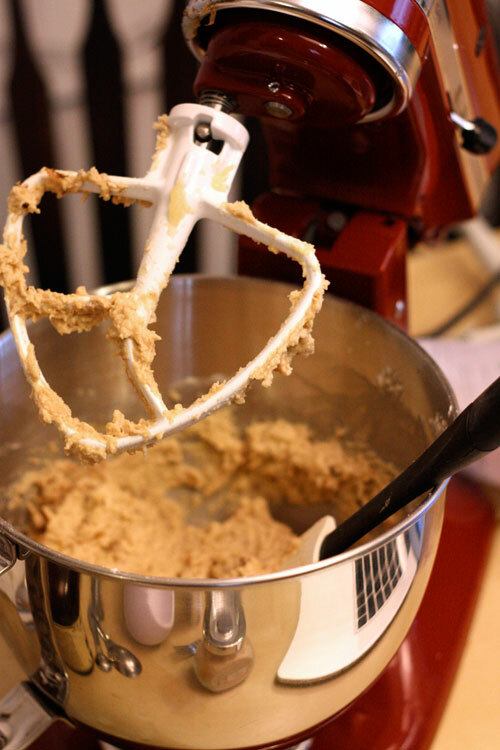 Beat cream cheese, butter, and vanilla with an electric mixer at high speed until fluffy. Sift confectioners sugar and cinnamon over cream cheese mixture, then beat at medium speed until incorporated. Spread frosting over top of cooled cake. Whenever there are catered events in my department, inevitably they feature platters of gigantic cookies the size of my face. Because I am a very creative person, I naturally started calling them ‘face cookies’. I’m not sure whether they actually taste any better, or it’s just my attraction their sheer size, but they’re completely irresistible, and I always seem to be capable of eating an entire face cookie myself. Then, in a flash of brilliance, I realized that I could make cookies at home that were also giant, and thereby also more delicious! And here I think bigger really does taste better, because the size makes for a high proportion of gooey center, which we all know is the best part. 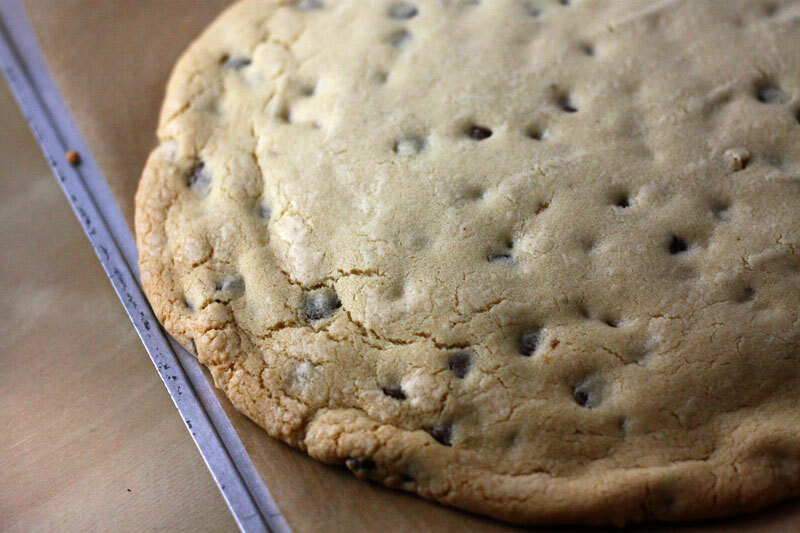 This recipe is pretty perfect for giant cookies: it’s a sturdy dough that manages to bake fairly even across the gigantic cookie, yielding crispy-chewy texture that’s incredibly addictive. Also, the strategic placement of a bittersweet ganache both balances out the sweetness and increases the adorable quotient. 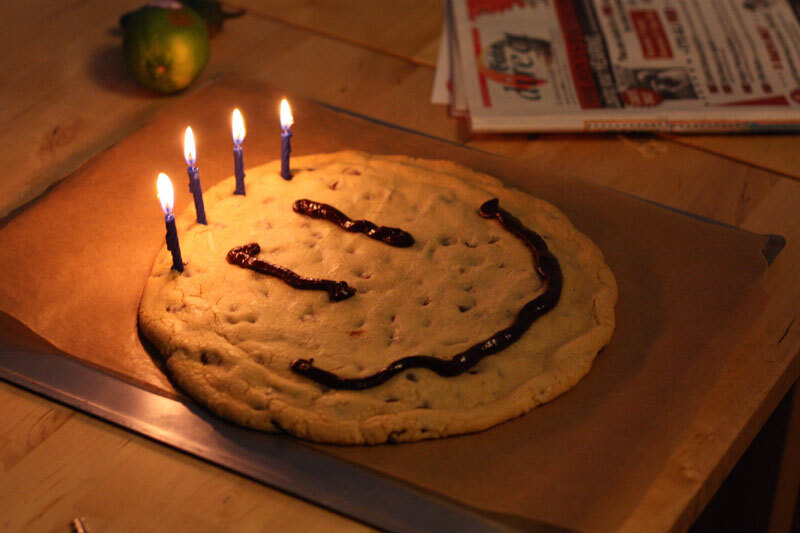 I gave this cookie to a great friend for her birthday, and I recommend you all do the same! Firstly, because it’s even cuter when you use candles for hair. And secondly, because you will otherwise eat the whole thing at once. After all, it’s only one cookie. 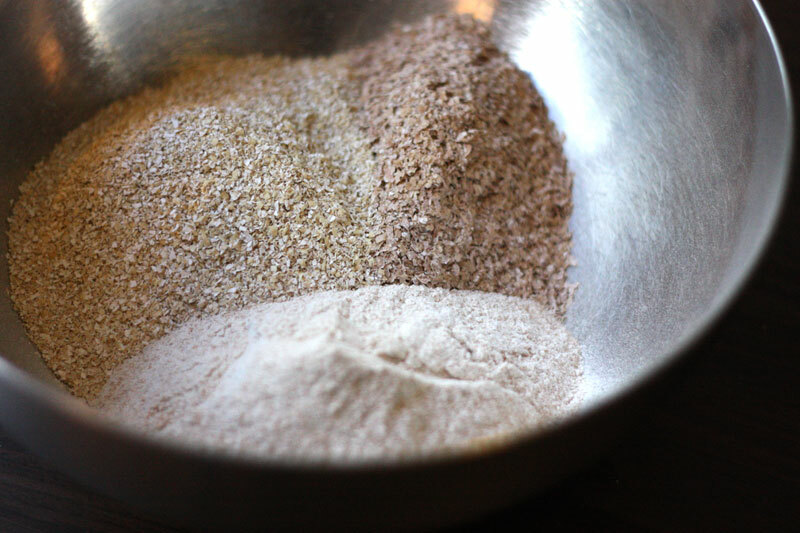 In a medium bowl, mix together dry ingredients and set aside. In a medium/large bowl, cream the butter and both sugars. Beat in the egg and vanilla. Add the dry ingredients and mix well. Fold in the chocolate chips. Bake for 13-16 minutes until the cookie is lightly golden brown. 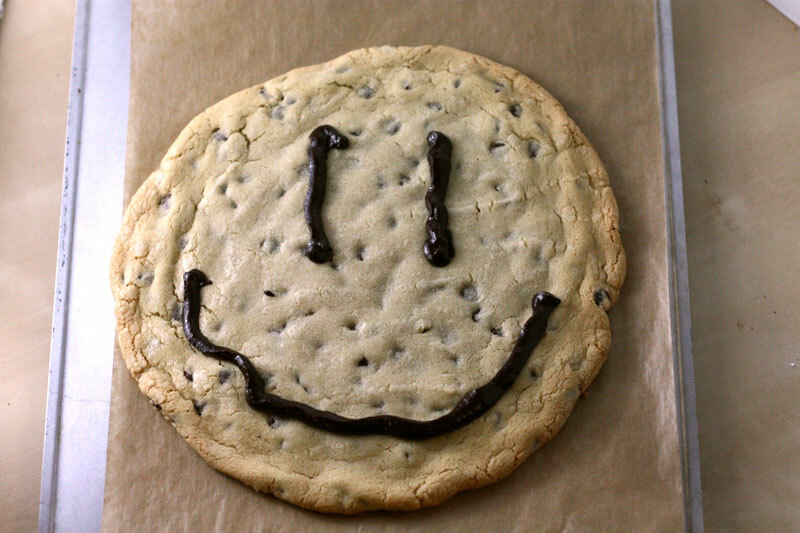 Let the cookie cool completely on the baking pan – this helps the cookie stabilize and set so it can be easily lifted off the pan. Once cool, gently use the foil to lift the cookie off the pan. 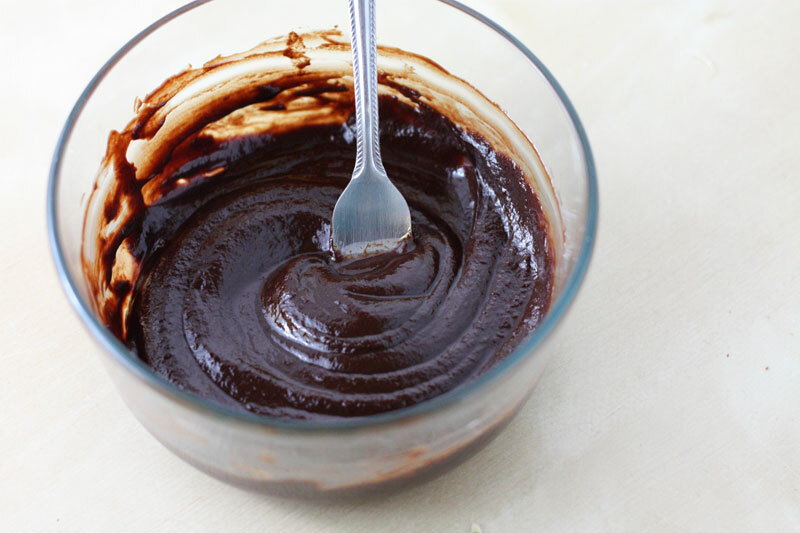 Combine chocolate and cream in a bowl and microwave on low in short intervals (30-60 seconds). In between microwaving, whisk the mixture, and stop microwaving as soon as it becomes smooth. Pipe onto cookie in happy faces. After a full month of copious overeating, I’ve finally recovered enough to make it back into the kitchen. I never thought I would be tired of eating chocolate, but apparently that day has come. I arrived back home from holiday travels to an empty cupboard and went on a rampant grocery store trip, returning triumphantly with piles of brightly coloured vegetables and an assortment of whole grains. Which I bought in bulk. I feel very virtuous. So my first steps back into baking were gentle: I made bran muffins. How unlike me! And they were delicious – moist, bran-ny, and didn’t leave me in a food coma. The original recipe says that they have no sugar, but since they have both honey and molasses in them I’m not quite prepared to make that claim. 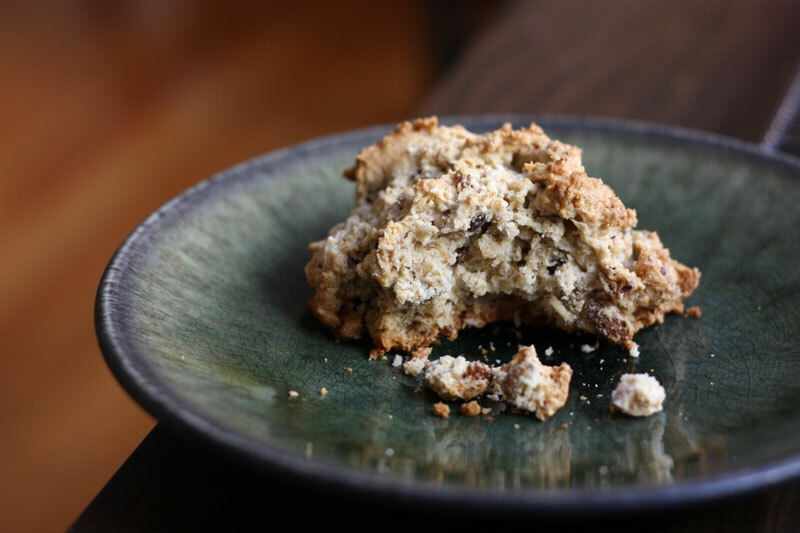 As baked goods go though, these are probably the healthiest things I’ve made (although that’s not a particularly high bar), and perfect for a winter breakfast. I made my muffins fairly small so I ended up with leftover batter. 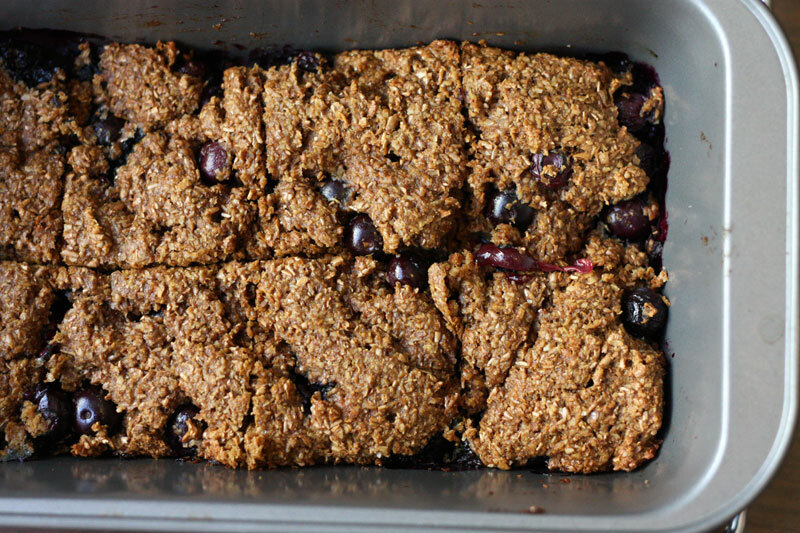 Being way too impatient to wait for the first batch to bake, I dumped it in a loaf pan and made blueberry bran squares. These are not very sturdy, but just as tasty. 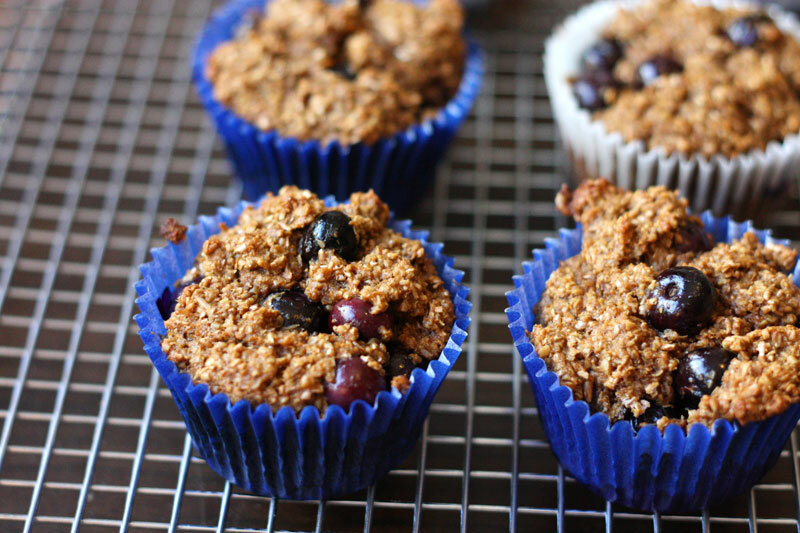 I also made a few muffins without blueberries, so that I could compare the outcome – I’m such a scientist! My conclusion was that both were great, and this recipe is worth making. I know the bran ingredients might seem a bit obscure, but once you find them they’re incredibly cheap. I paid 54 cents! It’s a good way to start the new year. Especially if you eat two. 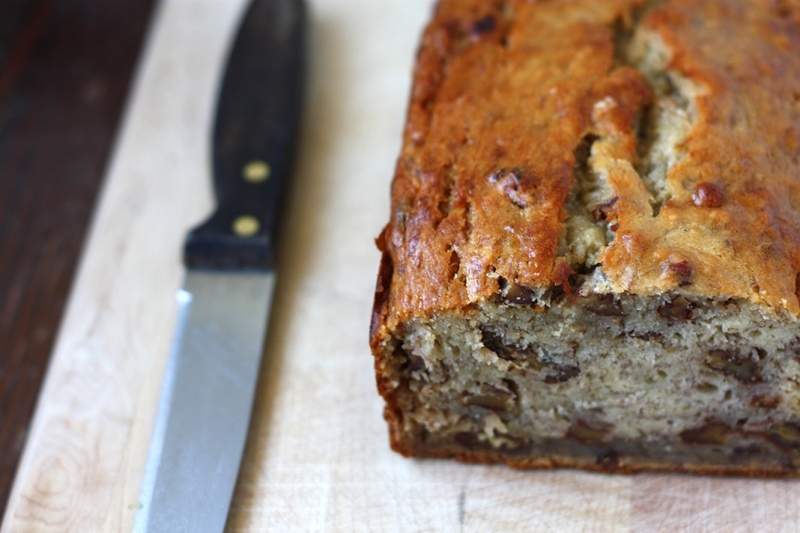 I strongly recommend weighing your dry ingredients for this, because the brans can pack dramatically different amounts into cups, and my volumes didn’t match up very closely with the recipe. Yield: 12 gigantic muffins, or 12 small ones and 8 bars. Preheat oven to 375°. Grease a muffin tin or line with paper liners. In a large bowl, combine wheat bran, oat bran, whole wheat flour, baking soda, baking powder, and salt. In a medium bowl, combine eggs, milk, yogurt, canola oil, molasses, and honey (and optional vanilla) and mix well. 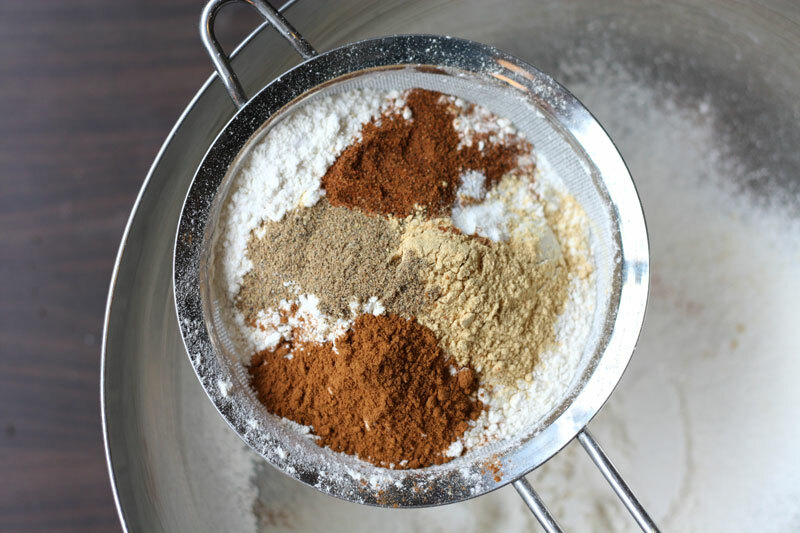 Pour wet ingredients into dry ingredients and mix with a rubber spatula just until combined. Fold in blueberries with as few strokes as possible. Generously fill muffin cups with batter. I had a lot of batter left over, so rather than make giant muffins I put it in a greased loaf pan. Bake until a toothpick inserted in the center comes out clean, about 15 to 20 minutes for small muffins and thin loaf, or 20 to 25 minutes for large muffins. 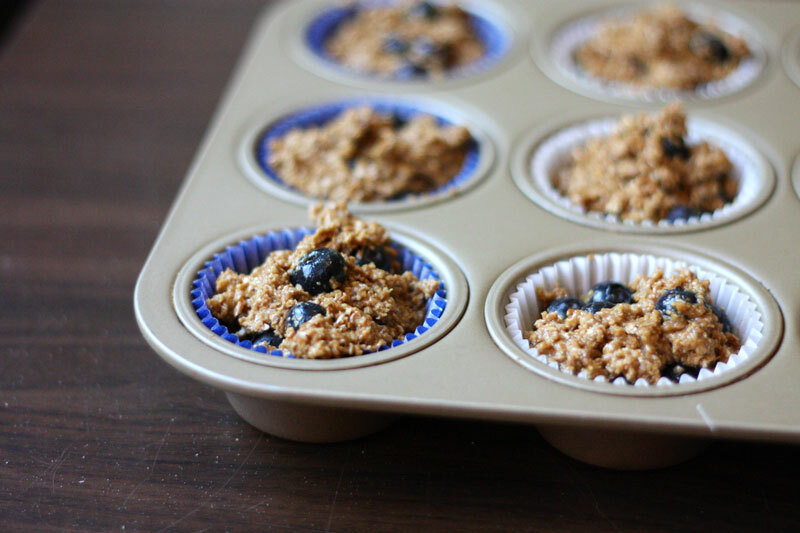 Cool muffins in pan for 5 to 10 minutes, then carefully remove from pan and serve warm, or let cool on a wire rack. Possible eating options: butter, honey, and peanut butter are all delicious. These are also reported to freeze well, though I haven’t tried it. 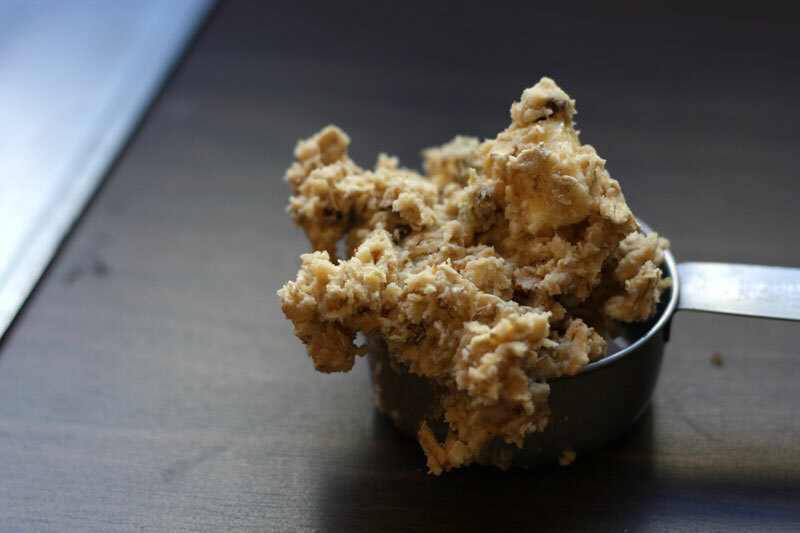 It seems like every baker has that one perfect recipe for chocolate chip cookies, that they’re so confident in that they need never try another. I’m not generally capable of doing that, since I have a neurotic need to test a bazillion recipes – what if the next one is better? The world could end without me tasting the best possible cookie! When it comes to brownies, however, I have my winner. I guess that someone as serious about chocolate as I am would have to have identified its most perfect vehicle. 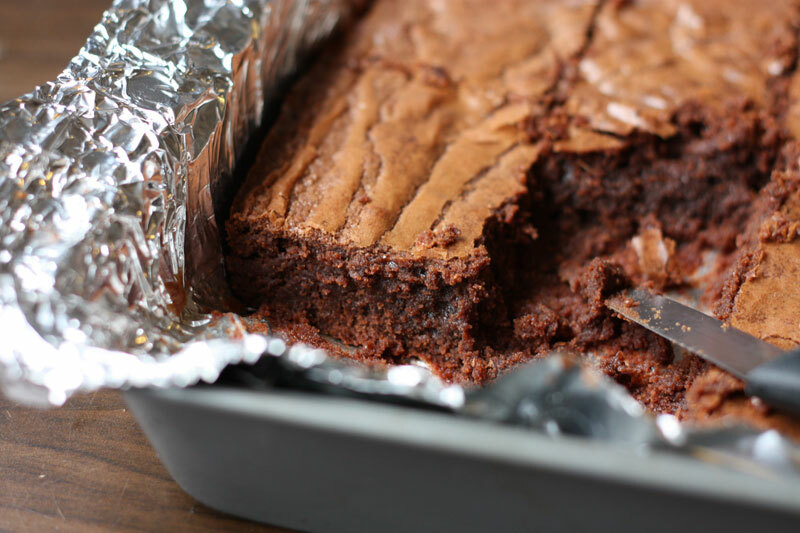 This recipe hits all my brownie requirements: dense and fudgy, but not because the batter is underbaked and gooey. They’re intensely chocolatey, so although I don’t actually expect other people to throw away money on fancy chocolate, it should be at least decent quality. The recipe also insists that you let them sit overnight before cutting into them. This is indeed tasty, but honestly who has the willpower? 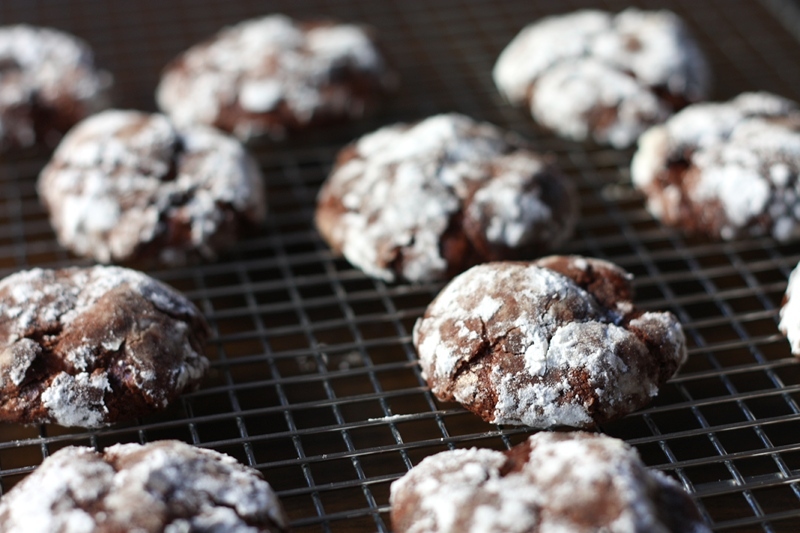 I promise they’re still incredible the day you bake them and absolve you of any guilt over premature brownie-eating. 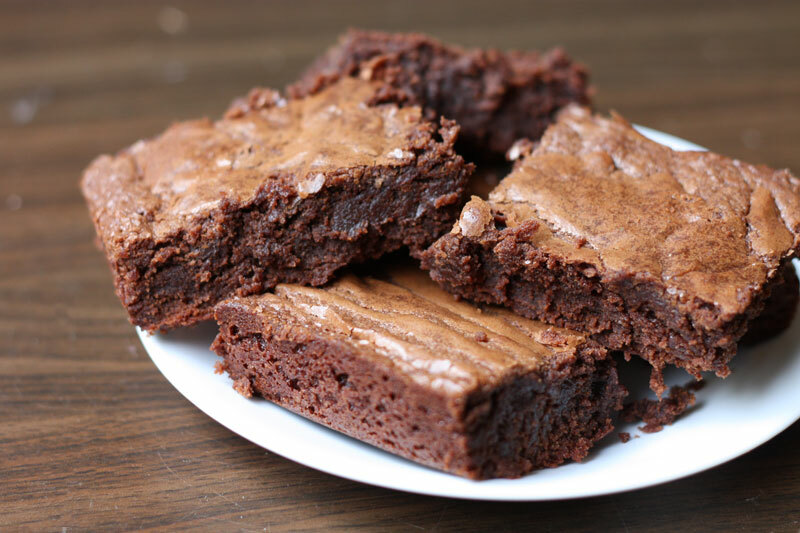 So here are my favourite brownies: not compared against all other possible recipes, because once I found them, I made them exactly again and again. I’m not saying I’ll never try another recipe, but I haven’t yet. 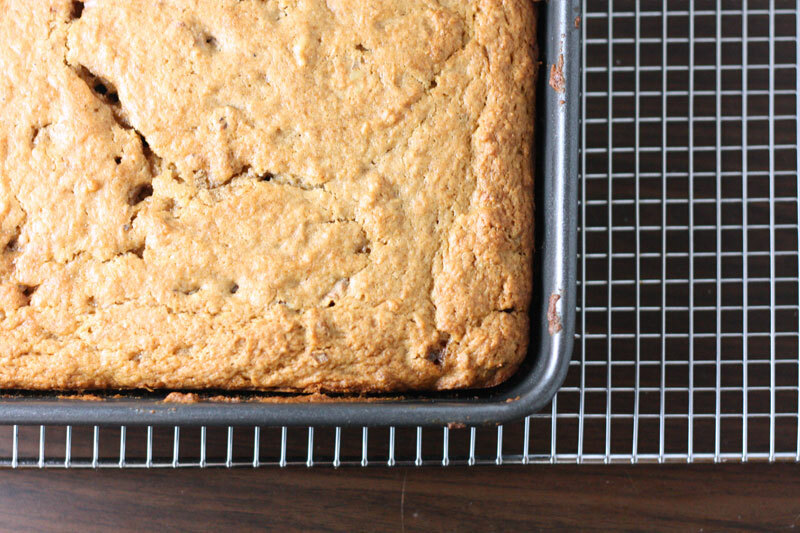 Butter a 13-by-9-inch baking pan and line with buttered parchment paper or foil. Preheat oven to 350°F. 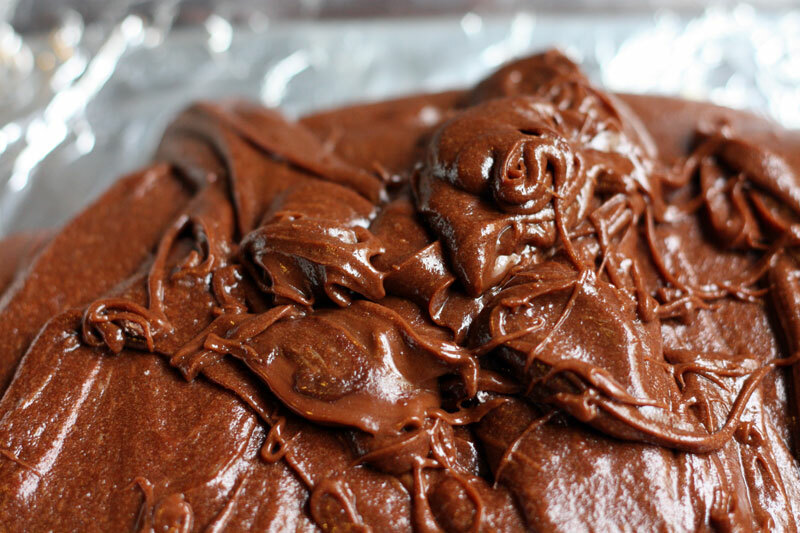 Gently melt butter and chocolate together in microwave, or on top of double boiler. Cool slightly. In a large bowl or mixer, whisk eggs. Whisk in salt, sugars and vanilla. 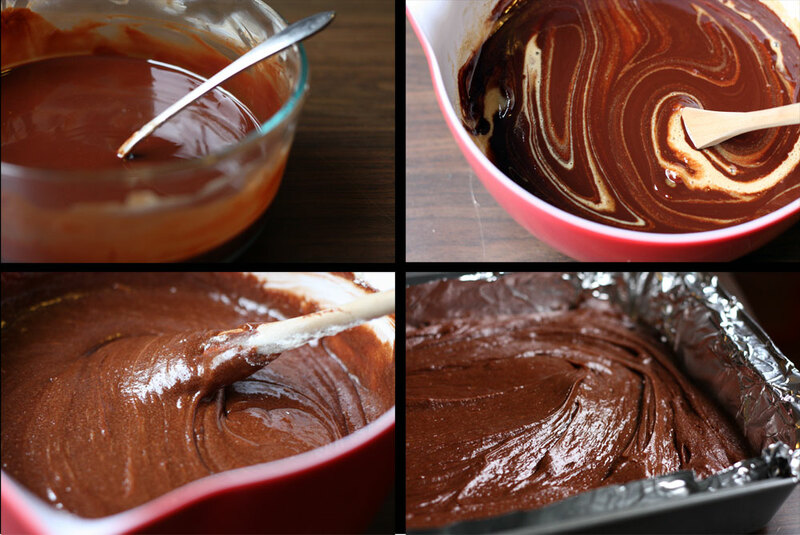 Whisk in melted chocolate mixture. 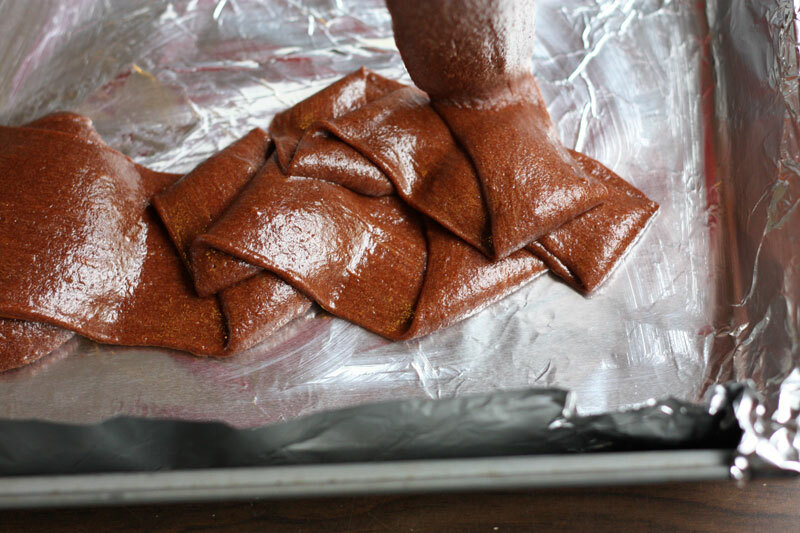 Fold in flour just until combined. Pour batter into prepared pan. Bake for 30 to 40 minutes or until shiny and beginning to crack on top. Cool in pan on rack. If you can stand the wait, cover the cooled brownies tightly with foil and store at room temperature overnight before cutting. I went on a bit of a baking bender last weekend. Possibly making up for a dry spell, I churned out cookies, brownies, bread, and a cranberry cake. It all sounds very impressive until I admit that I haven’t actually cooked dinner in almost two weeks. 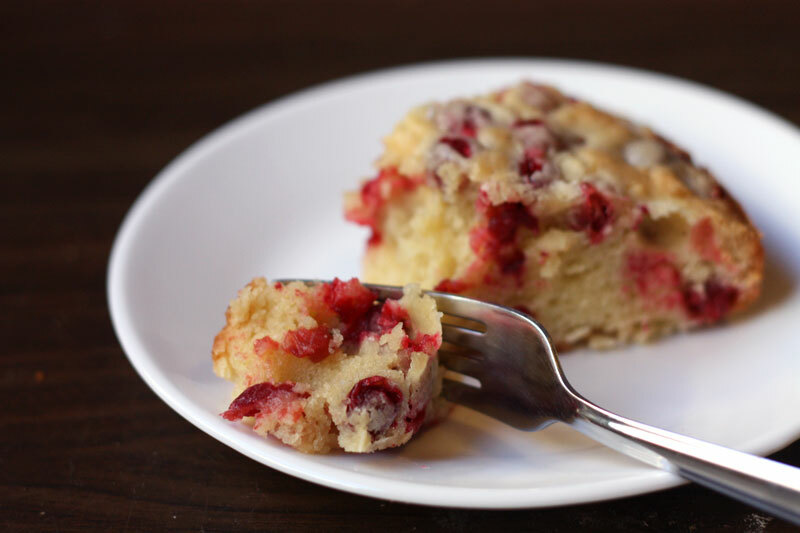 It’s surprising how far sandwiches and eating out will take you, but at this point I’m pretty much relying on the cranberry cake to count as my ‘fruits and vegetables’ serving. 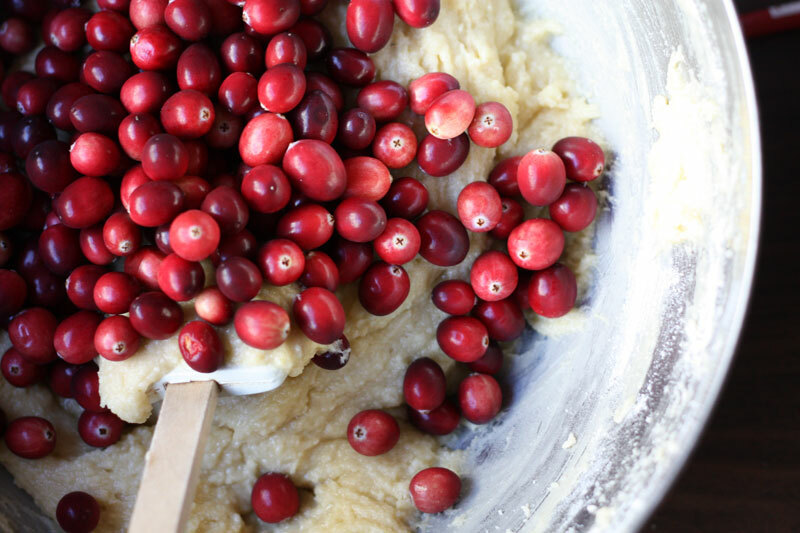 Cranberries are practically a vegetable, right? 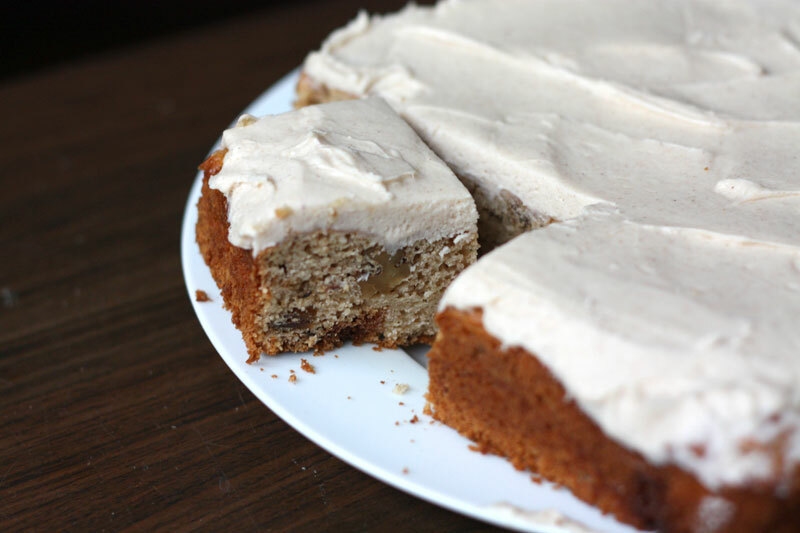 If you’re too busy to cook though, this cake is both quick and totally more worth the effort than real food (although I do recommend occasionally eating vegetables). I made it because I saw cranberries at the store for the first time this year and fell over myself in excitement to get them, narrowly avoiding taking out the nearby shoppers in my haste. 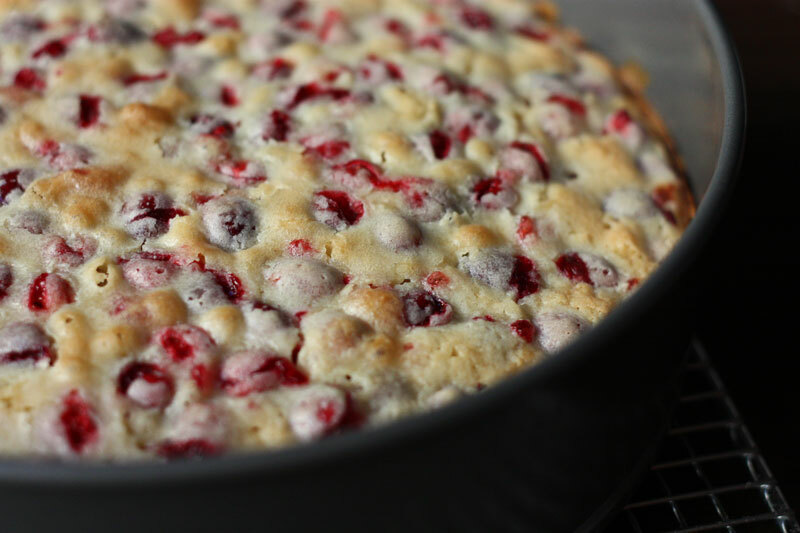 I love baked goods with cranberries, and this cake is a perfect example of why: it’s moist and dense and sweet, but the tartness of the cranberries in every bite balances it all out. It’s also seriously easy: one bowl, 10 minutes of mixing, then pop it in the oven. 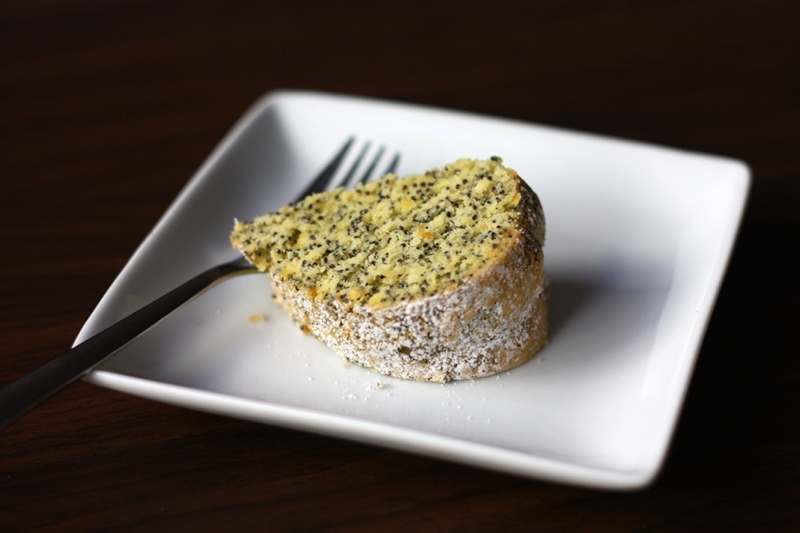 Out comes a cake that, despite its simplicity, and the fact that there are several other desserts sharing its spotlight, disappears surprisingly quickly. Preheat oven to 350°F. Grease a 9×13 pan or a 10-inch springform pan. In a large bowl, beat eggs and sugar for 5-7 minutes, until eggs have increased in volume and stream into ribbons when you lift the beaters. Add butter and vanilla and beat until incorporated, about 2 minutes. Beat in milk and salt. 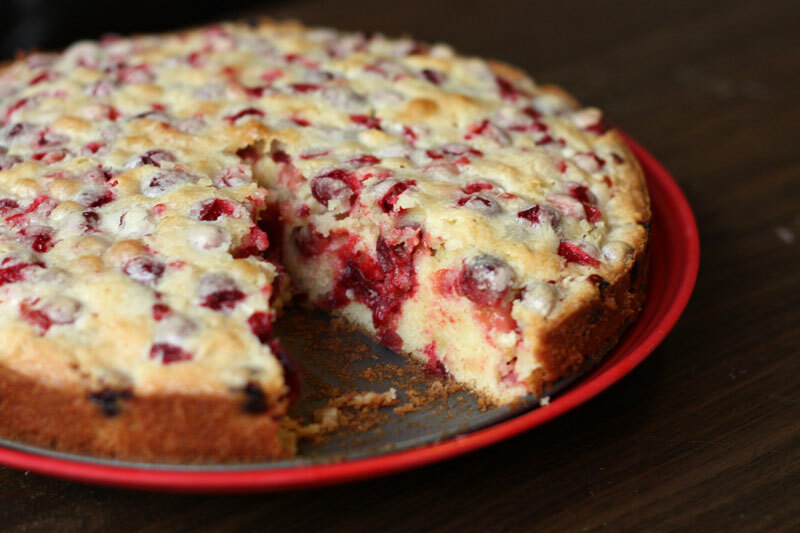 Stir in flour, then fold in cranberries. Scrape batter into prepared pan. Bake for approximately an hour, until a tester comes out clean (but there might be cranberry juices on it). Cool on a wire rack. If using springform, run a knife around the cake and then unmold. I like to get my work done in coffeeshops. I find the quiet buzz very soothing – maybe it’s comforting to know that even though I’m glued to my laptop, other people are chatting and sipping coffee and leading happy, civilized lives. The consequence, though, is that I’ve now tried most of the baked goods on offer in my neighbourhood. Some are fine, some are great, but when I tried the homemade oreos at Flour I immediately went online and bought their new cookbook. I wanted to replicate them exactly and then eat a bazillion. Well, yesterday the cookbook finally arrived, and distractible as I am I never actually made it to the cookies. 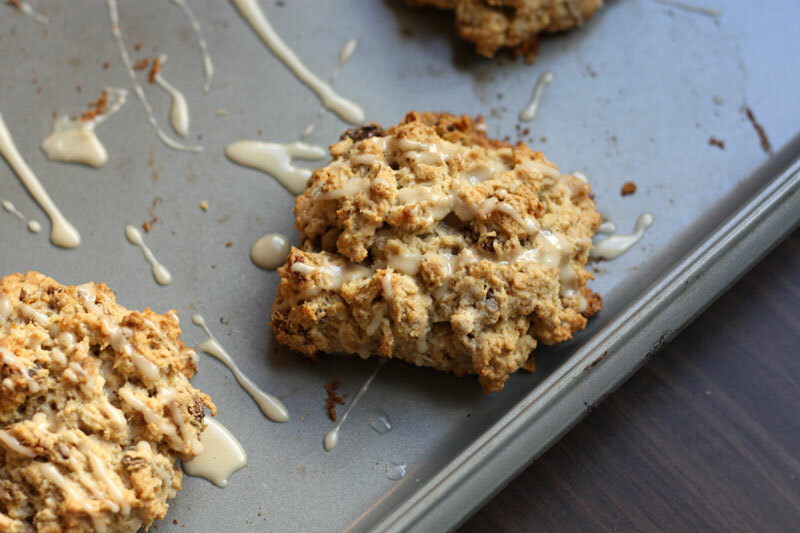 I stopped at the very first recipe: maple oatmeal scones. 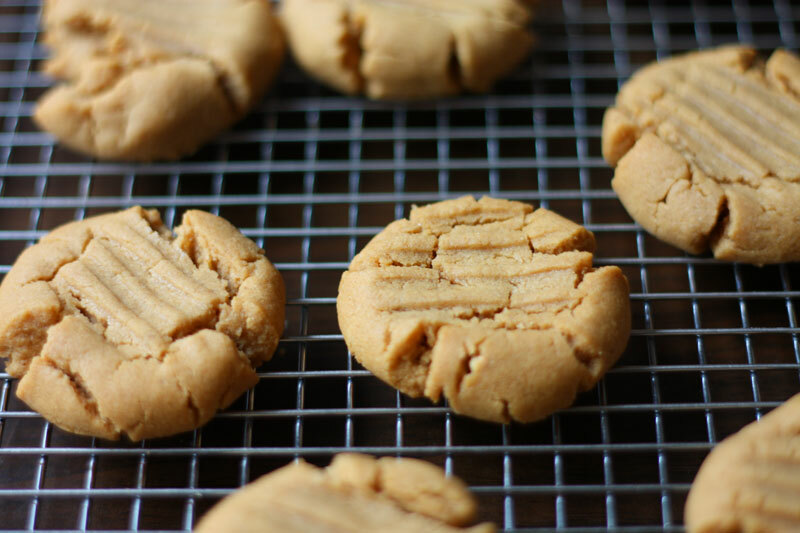 They sounded perfect for fall and they definitely are: buttery and nutty and not too sweet. 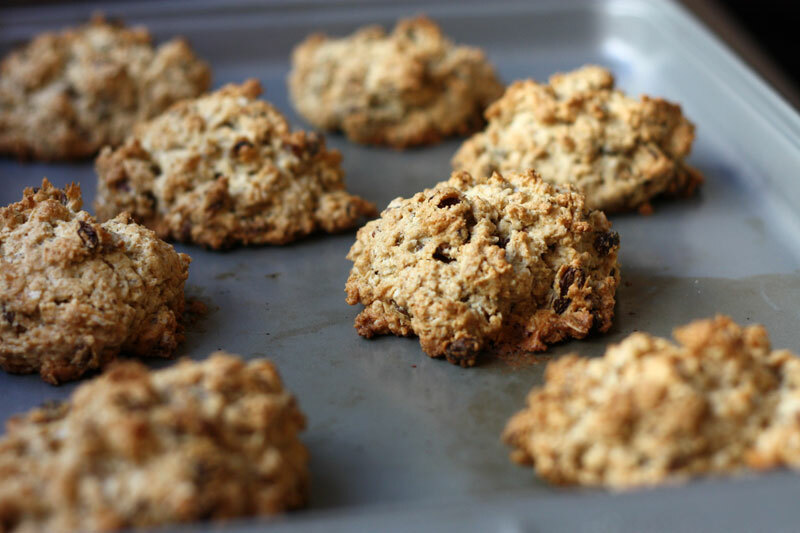 They’re very different from my other favourite scones: more texture from the oats, and with lovely crunchy bits from the nuts and craggy tops. By the time my roommates all woke up, they’d filled the house with the smell of maple, and I felt very productive for having baked before anyone else was up. It was made slightly easier by the fact that that was around 2 pm, but it still counts. So here is the ideal October breakfast: they have all the right flavours, and having the oven on helps counter the new chill in the air – I’ll probably start baking every day just in an attempt to keep my toes warm. Tomorrow I’ll try to make it to the homemade oreos, but I can’t guarantee that I won’t get distracted by the second recipe, or the third… maybe in a few months? The original instructions are for a stand mixer, and although I covet one I only have a handheld and adapted the instructions accordingly. If you do have one, you can use it for all the steps rather than only switching to it in the last part. 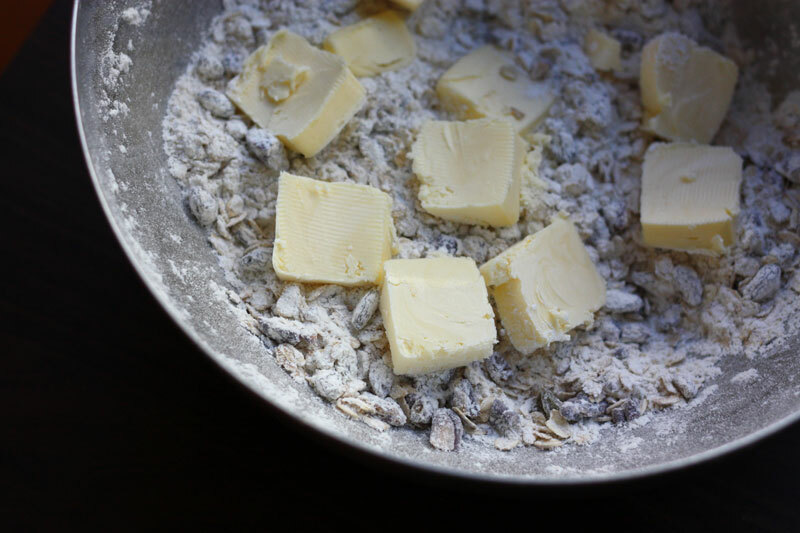 In a large bowl, stir together flour, oats, baking powder, baking soda, salt, pecans, and raisins. Scatter the butter pieces on top. Cut in butter with two knives until it’s somewhat broken down and grape-size pieces are still visible. In a small bowl, whisk together cream, maple syrup, and egg. Add to flour mixture, and use hand mixer on low speed until dough just comes together, about 20 seconds. Using a 1/3 cup measure, drop mounded scoops of the dough onto a baking sheet, forming 8 scones and leaving a couple of inches between each. 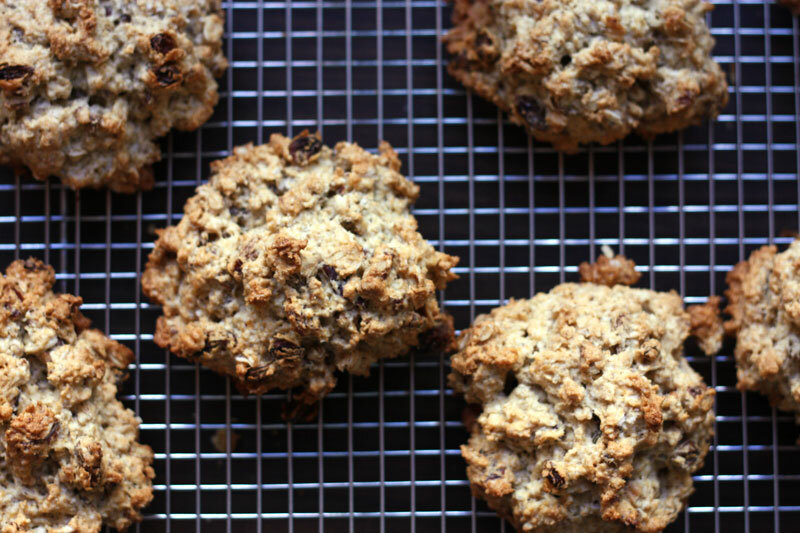 Bake until scones are golden brown on top, 30-40 minutes. Transfer to wire rack to cool. I found this to be incredibly sweet so just used a drizzle: next time I’d make a half or even third recipe. If you don’t like things to be too sweet, I’d recommend you go easy on the glaze. While scones are cooling, whisk together sugar, maple syrup, and enough water to make a pourable glaze. When scones have cooled 30 minutes, brush or drizzle glaze over.